NOTE: This project has been unmaintained for many years now, with no intent on my part to start it back up again. It absolutely won't work against modern Minecraft versions anymore, so it's probably not something you care about. I'm leaving the site up for historic/sentimental reasons - if you're still using an old version of Minecraft yourself for whatever reason, you may find it useful, but probably not. The original versions of Minecraft X-Ray can be found in this forum thread, though they don't work with modern Minecraft versions anymore. Many thanks to plusminus, the original author of X-Ray, for both creating such an excellent program, and for releasing the sourcecode so that it could live on. The changed-feature list is becoming a little cumbersome to deal with in this post, so I'll just pick what I consider the main ones here. See the Changelog on the site for the complete list of changes. Full support for all blocks through Minecraft 1.2.0. This includes Nether blocks, Lapis Lazuli, Note Blocks, Beds, Trapdoors, Pistons, Huge Mushrooms, Iron Bars, Enchantment Tables, Jungle blocks, Redstone Lamps, etc. Blocks are loaded on-demand, and the app should handle worlds of any size. This also results in much faster initial load times. The app can get noticeably glitchy when loading chunks; I'll be working on that. The minimap will only show loaded chunks, so is a little less useful. Once I figure out how to get chunks to load in the background without severe framerate drops, I'll have the minimap populate silently in the background. The app does leak memory, and will eventually crash with an OutOfMemoryError if you keep loading new areas of a large map. I suspect that most people won't run into this, though. Again, I'll try to figure that out. As mentioned above, full sourcecode is included. X-Ray is available under the New/Modified BSD License. Well, a nice new thread, and it really needs it, as the program is essentially quite different than it was before. To continue the discussion from the last thread, I did some experiments with Eld's texture pack and it's missing water & lava. 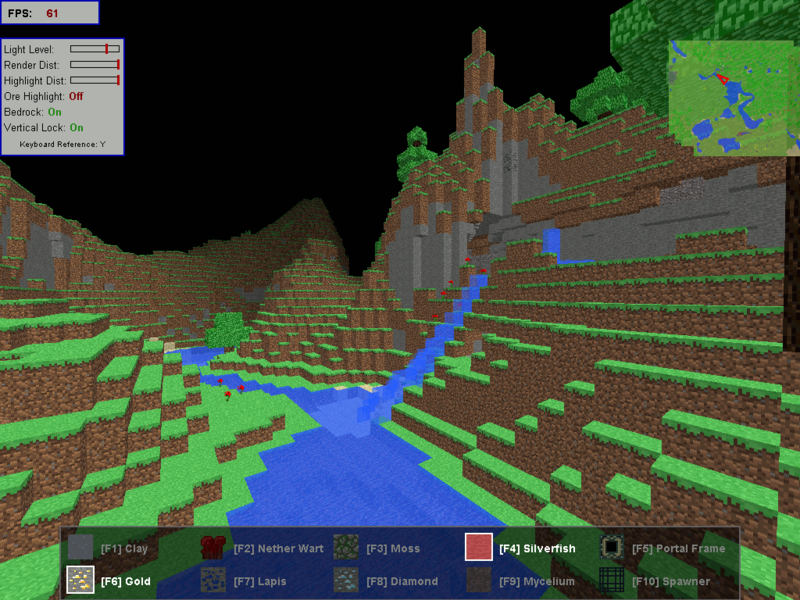 I still don't know how Minecraft generates water & lava while using that pack, the textures just aren't there. Doesn't matter how I install the pack, either by dropping it directly into Minecraft.jar or by using the built in texture pack switcher. 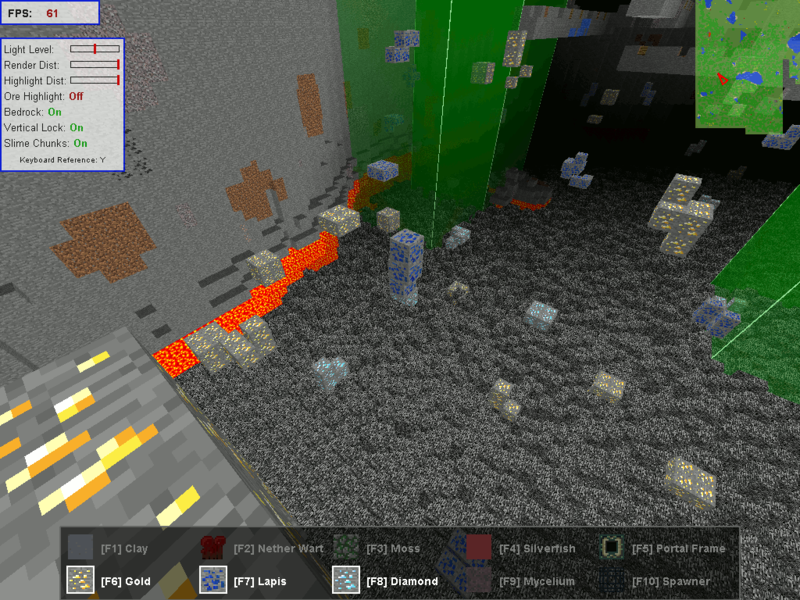 Same result, water & lava work fine in game, but Xray doesn't see them, and shows nothing. I will look into it more over the next few days as I have some time off. There must be something embedded in the code to generate the textures for those, as they are all animated. For that matter, where was the texture for the Christmas cape? It's not in any of the texture files that I could see, so it must be embedded in the code - is that possible? On that note, I kinda like the no water look, would it be possible to add a toggle like there is for bedrock? Makes finding underwater structures and clay deposits much easier. If it's too much hassle, don't bother. While we're talking new features, (ahem) how about a coordinate display? Either a way to show the x,y,z of what you're looking at by selecting it somehow, or just the x,y,z of the current viewing position. I've found that makes things a lot easier to navigate while using MrMessiah's simple map with coordinate display on or just the F3 key. Makes finding the exact spot to work from simple. Again, if it's too much hassle, it's not high on the list, I'd rather have large map support first and foremost. so it must be embedded in the code - is that possible? Yeah, embedding graphics in code isn't difficult at all; graphics are, after all, just an array of pixel information. It's less common to do so nowadays, of course, but in the past there have even been graphics formats specifically designed to be in code. Yeah, that should be pretty trivial. Will give that a go for the next release. While we're talking new features, (ahem) how about a coordinate display? Either a way to show the x,y,z of what you're looking at by selecting it somehow, or just the x,y,z of the current viewing position. Actually, this one's already in there as it turns out (it just hadn't been listed in the key list until now). The grave accent (or backtick, underneath the tilde) will toggle a little box which gives you both world and chunk coordinates (and memory usage). Hey, great, any chance of adding the height to that readout? It only has x & z, no y. Thanks for the info on the other stuff, though I don't think I'll have much luck searching the code for embedded graphics like that. So useful... so many ways.. I was thinking about how the fire is displayed and the way it makes the background transparent when viewed from certain angles. Would it be possible to just display fire as a sprite like flowers are now? Instead of trying to texture a block with the fire texture, which causes weirdness, just use two of the textures in an X pattern in that block position, and that should look fine. Not sure if that's easy or even possible, just thought I'd toss it out there for consideration. Yeah, I want to fix fire rendering eventually, but it has to be handled specially. The fire textures are stored in a different file and are rendered differently from everything else in the Minecraft world. Obviously it's possible to render correctly. I just haven't taken the time to figure out the best way to do so. We'll see if I can whip something together for the next release, or not. Not going to promise anything at the moment, though. Ah, OK, gotcha. Definitely not a high priority if it's not something simple to do. It might be obvious for some but I have to ask anyway: How the hell do you get this thing to work? I've downloaded the file and extracted it and tried running Run.cmd and minecraft_xray.bat. Nothing. Some instructions would be nice. Oh, and you do need Java installed for this to work, btw. I've found the problem. The Maintenance Branch 4 zip doesn't contain a .exe! Please fix! In the meantime, MB 3 works just fine. You can find it on the official site under previous versions. Oh, duh - forgot that I didn't get EXE generation worked out until after MB4. There'll be one in MB5. Though actually you can use the EXE from the original X-Ray if you want; the original EXE will work fine because all it does is launch Java and run the stuff in the current directory; the EXE itself doesn't contain any actual data. ... and that is a bit odd, because MB3 doesn't include an EXE either. I wonder why one works but the other doesn't. HA-HA! Thank that sorted it out. 2nd edit: nope, it's not me. Hm, interesting. What version of Java does Leopard ship with? (I know that they've got their own JVM in OSXland so it may not be entirely useful info). Should be able to find out by running "java -version" from Terminal. Oh, heh, k. Prior to MB4 I had just been copying over the old non-MB directory and then overwriting with the newer stuff, which would have left the EXE in place. In MB4 I had switched over to a more sane releasing schedule but hadn't had EXE generation working yet. Guess I didn't even think that the previous method had been copying in the EXE. Anyway, future releases will include it as you'd expect, so yeah. Not sure what it's shipped with, it's been updated since then however. Ah, yeah, that's what I meant, anyway. ... though that's definitely the issue there. The MB stuff has been compiled using a Java 1.6 release; I'd bet that it's incompatible with 1.5. Is there a 1.6 JVM available on OSX? Do the old non-MB X-Ray releases work properly on your system? I could take a look at possibly compiling it on 1.5 for future releases. First and foremost, thank you for continuing on with this after +/-'s disappearance. I'm so happy someone picked the ball up here and ran with it. This app is just too handy to be left in limbo. Forgive me if I missed something here, but is there a way to change the mouse sensitivity (and remap keys) in this program? Hm, I don't think I'm going to be able to do much about those; it's a bit hard for me to diagnose that kind of thing without access to the actual platform. Perhaps somebody who has gotten it working on OSX would be able to shed some light on it. If not, is that planned for a future release? At the moment there isn't, though it's something that I would like to have in there eventually. I'm not going to promise anything, though, since work on X-Ray is pretty contingent on how much fun I have while doing it, and stuff like key mappings is boring to code. We'll see though. In other news, I have been poking at X-Ray occasionally, and hopefully I'll have MB5 out next week sometime. 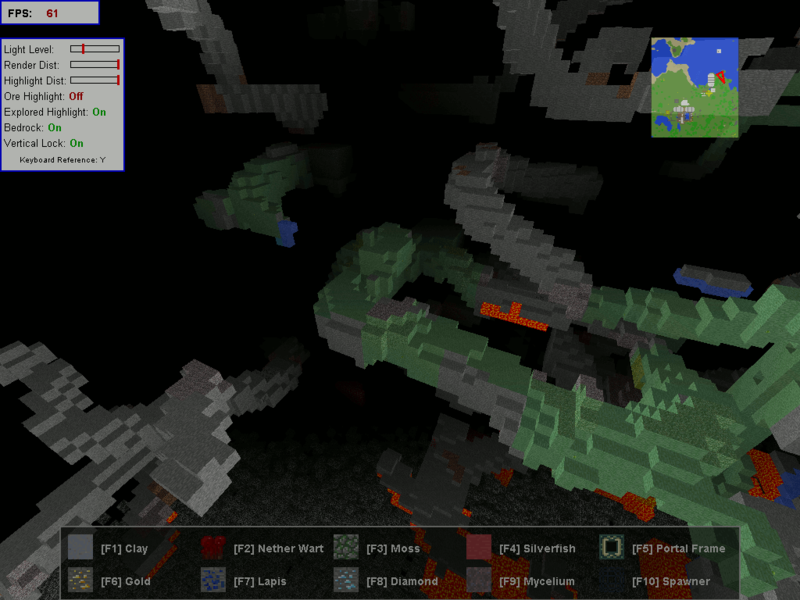 The biggest change is that it'll load chunks on-demand now, and should support any-sized map. A side-effect of that is that startup times are drastically reduced, since it's only loading your immediate area when you start the app. Note that this does mean that the minimap is, for now, only going to show places that you've visited already, which does kind of make it less useful, but c'est la vie! As of right now, the biggest things blocking the release are some issues with the minimap, and some glitches where cube faces aren't being drawn all the time at chunk boundaries (so you end up with "gaps" in the terrain on the sides of hills, etc). Once those are figured out, I'm probably going to make an attempt to add in some kind of "explored dungeons" mode, where the area around placed torches is rendered with a tinted color of some sort, so it's easy to tell which caves you've explored and which ones you haven't. We'll see if that ends up happening or not. Oh, and for the sake of discussion, over the weekend I ended up playing around with some tools to reconstruct a Minecraft level, given packetdumps from a Minecraft SMP session. I've been thinking it'd be hella sweet to be able to have X-Ray fire up a packet sniffer if requested, and have an option to piggyback along with what the player's doing in Minecraft (toggleable, so that you could unbind the camera and zoom around, etc). I'd kind of doubt that that'll ever actually make it into the program, but we can all hope. Also I'd probably only be able to support it on Linux, even if it did end up happening, so Windows folks might not want to get too excited about that unless they'd be willing to do some (still entirely hypothetical at this point, I should say again) coding of their own. Edit: Oh, and one other thing that I do want to get in before the next release is some kind of togglable status popup/overlay thing (probably on by default) which shows what various options you've got set, since there are so many of them now (draw distance, highlight distance, ore highlighting, ore highlight distance, etc, etc, etc).